We reserve the right to prohibit admittance of pets lacking proof of vaccinations, and/or pets displaying signs of untreated or potentially contagious conditions, and/or aggressive behavior. We close in honor of major Federal holidays. We request that guests check-in no earlier than 2 PM and check-out by noon so that we may prepare the suite for the next guest. Late check-outs or early check-ins shall incur a $25 fee for the additional care and services we must provide your pet during that time. When we are closed to the public, departures and arrivals shall incur a $100 fee. This includes the early or late fee. We accept reservations with a required, one-night deposit. For reservations cancelled 5 days prior to arrival, we fully refund your deposit. During holidays and peak season, we require three nights’ deposit, refundable if cancellations are made 10 days prior to arrival. We reserve the right to require a three-night minimum stay. Cancellation of salon and day spa services within 24 hours of appointment time shall incur a 50% service charge. All rates and services are subject to availability and change. We do not up-charge during peak periods. Every canine guest staying 3 nights or more must receive our House Spa Bath. (This is not included in the suite package, but which we provide at a discounted rate). For spa bath or full-grooming services, additional labor fees may apply if your pet requires labor-intensive service, such as under-coat removal or coat de-matting. Our house food includes no corn, wheat, or soy (common allergens) and consists of human consumption-grade ingredients. Designed for sensitive stomachs, it is particularly excellent for boarding, when new stimuli may cause digestive upset in some pets, even when on their own food. If you choose to bring your own food, we ask that you please prepare each meal’s serving size in a separate baggie for each day of your pet’s stay. 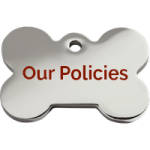 Pet owners are solely responsible and liable for any and all actions of their pet during the stay at OTPR, including, and not limited to, injury to another pet, an OTPR staff member, or a member of the public. In the rare case of an emergency or health concern, we will contact you. We shall administer aid and non- prescription treatments, as needed. If veterinarian attention is deemed necessary, we shall take your pet to your veterinarian of record; or, to a 24-hour, veterinary emergency hospital if your vet is not available. With admittance, you accept responsibility for any expenses resulting from such outside treatment, as needed in the event of accidental injury, illness, or symptoms, arising during or after your pet’s stay with us. Please understand that despite OTPR’s commitment to the highest standard of pet care and supervision and to facility design and cleanliness, accidental injury and illness may occur. Images or videos of your pets and you might be taken for social media or marketing material. Your signature on the policies and admittance agreement grants unrestricted use and publishing of any such images. Due for a check-in exam during your next boarding stay? Fill in your portion of the Exam Form to save time! Coming in for a Day Camp Evaluation? Click here to fill out the Pet Personality Profile prior to your appointment to save time!